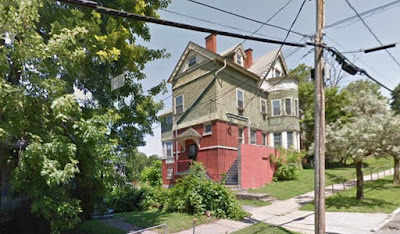 The two oldest houses on Madison Street on the Syracuse's Eastside, were recently demolished by their new owner without much notice or any comment. The houses were tired-looking, but not derelict in anyway. They have been income earning rentals for decades. This block is also noteworthy for the Herbert Walker House (1911) at the corner with Walnut Ave. 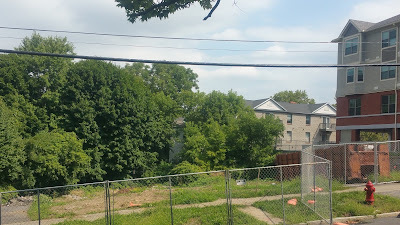 The removal of these houses continues the transformation of Madison Street from a street of private houses, to one to houses turned into (mostly student) rentals, and thence into larger apartment complexes and more surface parking. This is all part of the surging real estate and building boom on University Hill, where the expansion of University populations and the willingness of students (or their families) to pay to top dollar prices has made housing on The Hill more lucrative than ever. We'll be seeing more and more student apartment buildings - often five stories or more - in the next few years. One of these just went up on University Ave. between Madison Street and East Genesee, right across the from where the new Ronald McDonald House was built a few years ago. The last time a big wave of development swept this area was a century ago when the 900 block of Madison St. and some adjacent areas were rebuilt with Temple Concord (1911), the Sherbrooke Apartments (1914), the Madison School (1917), the Chaumont Apts (1928), the Washington Arms Apts (1928) and other buildings were erected - all before the Great Depression of the 1930s. My guess is that the two wood-frame Italianate houses were probably built some time between late 1860s through the early 1880s. 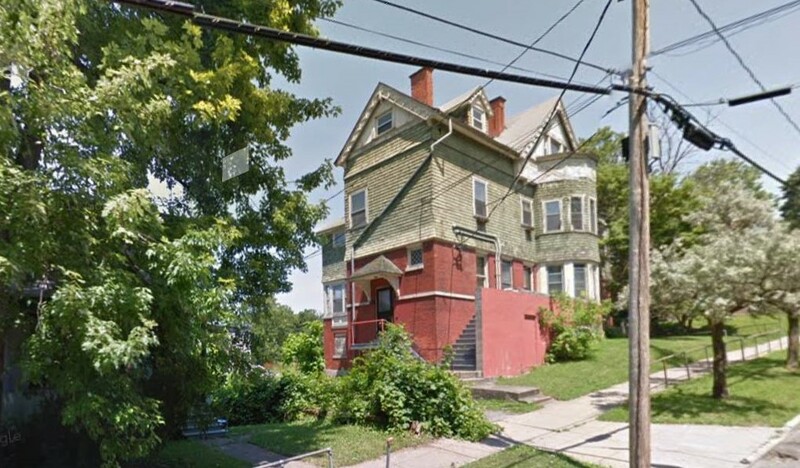 I have not done detailed deed work to determine their actual date, but cube-shaped Italianate houses of this type either in wood or more expansive brick, often with expansions on the rear, were once common throughout the city. They survive most in areas where development pressures have been limited. Today they are gone from the downtown, and now with the removal of the houses on Madison, they are about gone from the Eastside, too. 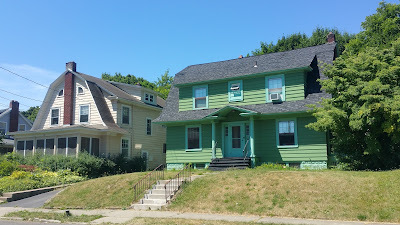 The largest number of similar houses can be found north of the former Eire Canal, in what is now the greater Hawley-Green in the many area, and then further on the Northside on the many blocks of the old First Ward, near Washington Square. I have an office at Temple Concord on Madison Street and have walked and biked this block of Madison Street for years, all the while watching changes. 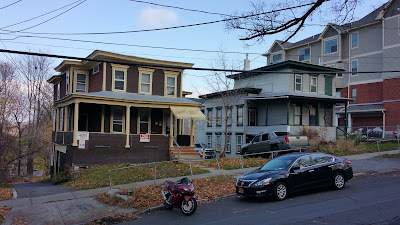 When the owner of these house died recently, and then her estate sold her rental properties, I suspected that these structures were doomed to be replaced be something bigger and shinier - like the expansion of an old house at 116 Comstock Avenue right next door. 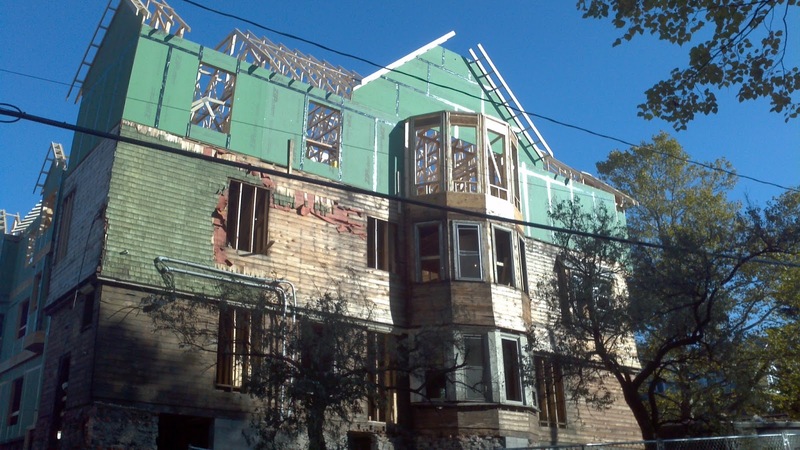 That project in 2012, undertaken by William A. Osuchowski and his family real estate/rental firm OPR Property Management, changed a two-and-half story Queen Anne corner lot house into an three-and-a half story apartment building that covers twice the ground. The new structure - which is quite attractive in a new-old sort of way - incorporates some of the old structure (see photos),and now has at least seven or eight units, some of which have three bedrooms and rent for over $2,000 per month. 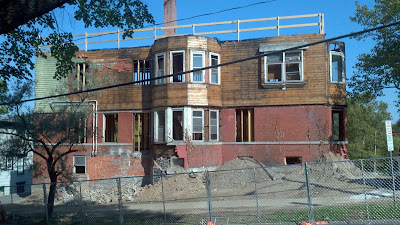 The now-demolished houses were, I believe, purchased by Osuchowski, who in January 2015 filed to have the three properties joined as one. That means the site of the two house may be developed, or they may be used for more surface parking, but I assume the former, since why would any buyer give the existing rental income? 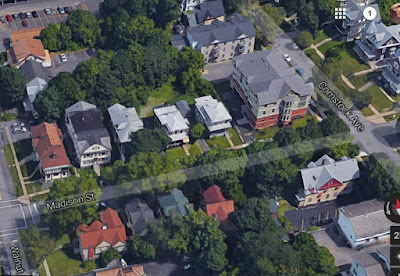 One can see from google maps how much surface parking has already been added to the 1100 block of Madison. This is a hillside site and the problem of water runoff needs to be considered. 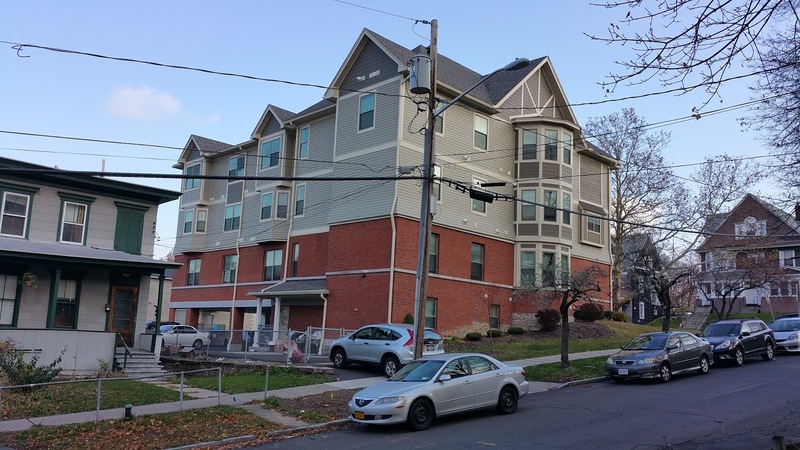 Certainly, this type of development if not done properly undermines any local gains of Onondaga County's Save the Rain program. 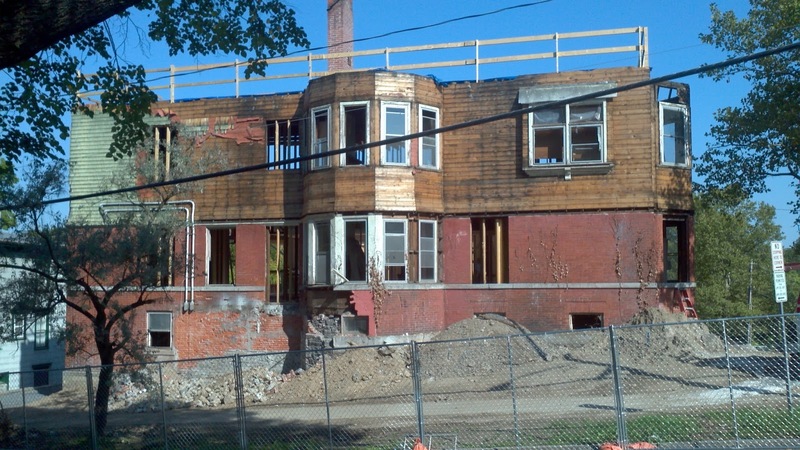 This type of transformation is inevitable in a neighborhood where there is such demand. Except for the Walnut Park area - which is a National Register Historic District and ideally should be locally protected - most of the Hill has lost its historic integrity. The earlier appearance and atmosphere of the area cannot be saved or re-established. We can and should, however, have some design guidelines and design overview to with the goal that the neighborhood begin created today will have aesthetic and quality-of-life values in the future, as well as economic value in the short term. It would be good to see zoning, planning and design guidelines for the area applied not in a reactive piece-by-piece manner, but in a pro-active and more comprehensive way. Perhaps the new ReZone Syracuse effort can address this? We also need to be attentive that the transformation of the 1000 and 1100 block of Madison Street does not spill over without serious review onto the 1200 block of Madison, which forms the northern boundary of Thornden Park, and beyond. Already on that block and further east the "remuddling" of many fine old houses has stripped the neighborhood of much of its visual stimulation. 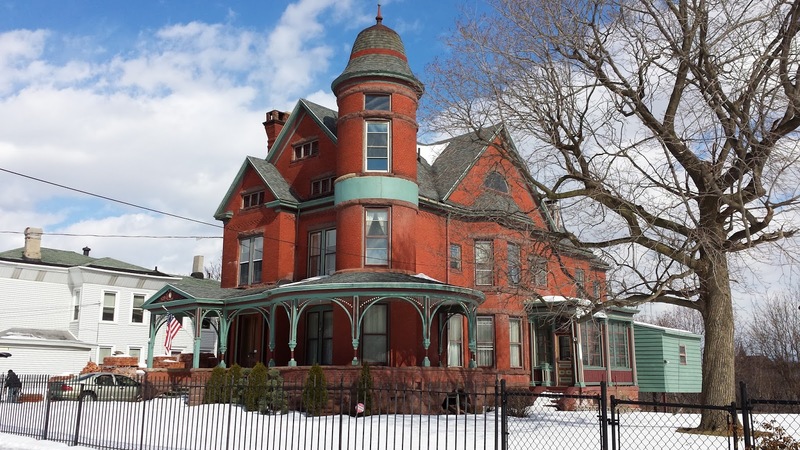 I hope that whatever replaces the 19th-century Italianate houses on Madison Street can also last a century and look as good, and the money invested creates local jobs; and that income from the project gets reinvested in Syracuse as much as possible. In my Westcott Neighborhood in Syracuse, and in many other areas of the city and inner suburbs developed in the early 20th century, one of the most notable house types is the so-called Dutch Colonial Revival House, with its distinctive gambrel roof. 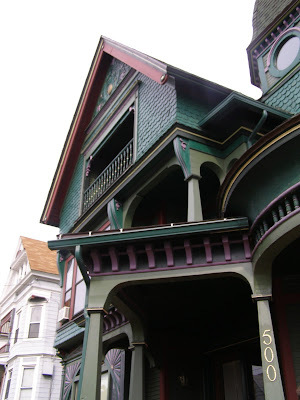 I'm often asked the origins of this house type, with the interlocutor hopeful of some telling historical anecdote. Alas, the history and popularity of the form has less to do with early American history than more modern American marketing. There is nothing Dutch about the house and it has nothing to do with Dutch heritage. As Daniel Rieff, in his Houses from Books: Treatises, Pattern Books, and Catalogs in American Architecture, 1738-1950: A History and Guide (University Park, PA, Penn State university Press, 2000) has pointed out: "Although the house type was recognized as not found in Holland—while common enough in England —for better or for worse, this house type must be called “Dutch Colonial,” as it has been for more than ninety years." Architects had been playing with the gambrel roof for houses since the 1880s, when they were common elements in shingle style houses. 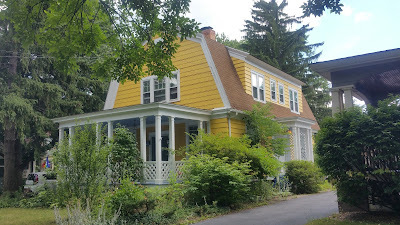 There were also some examples beginning around 1900 of the gambrel roof associated with "Colonial" elements In 1907, the type with a long shed dormer (rather than several discrete dormers) was defined as "Dutch" and presented by architect Aymar Embury II in a house he designed for a Garden City competition. The next year he popularized the house type in an article in International Studio (August 1908), “Modern Adaptations of the Dutch Colonial,” and in 1913 he published a book, The Dutch Colonial House: Its Origin, Design, Modern Plan, and Construction (1913), which forever established both type and name. 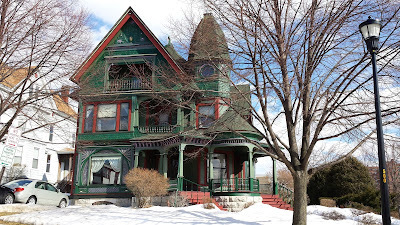 It became popular throughout the United States but it is possible that after Embury's designation it had a special appeal in New York State because of local (but not in Syracuse) Dutch history. 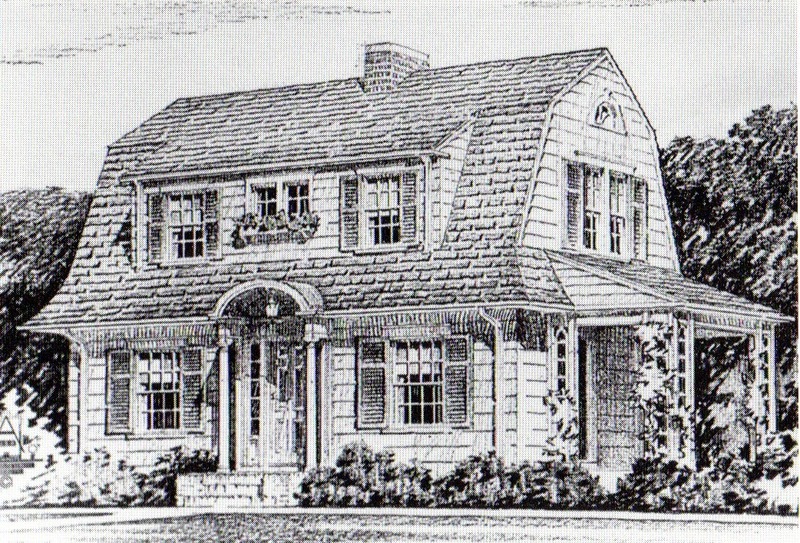 Dutch Colonial House as described and illustrated in Loizeaux, Classic Houses of the Twenties, "Which Style of Home?" 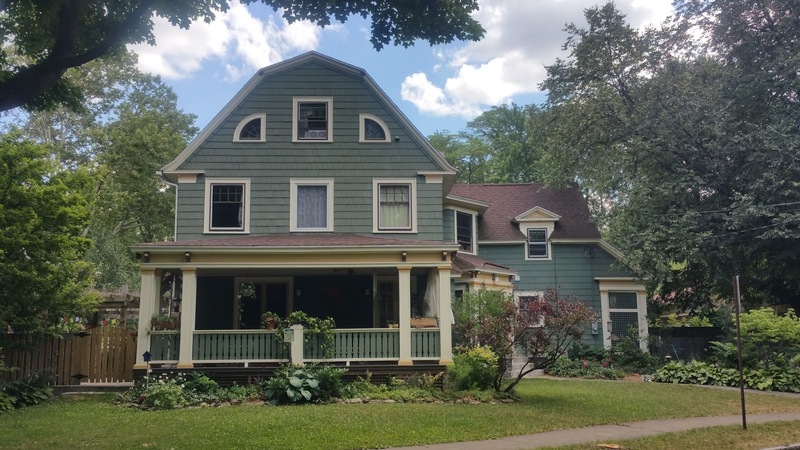 In plan, however, the house differed little from the even more common gable roof house, popularly dubbed Colonial, though in many of the Dutch designs the construction of the second floor (bedrooms) and attic were conflated. The gambrel roof - where each roof slope is broken into two jointed parts, allowed for more head room on the topmost story, in what otherwise might have been an attic. In the larger versions, where the house had two full stories and then a gambrel roof, the third story became more usable space - with high ceilings and more light. 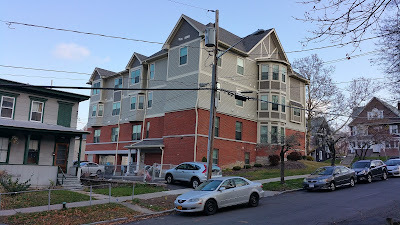 In the Westcott neighborhood, the Dutch style is especially evident on the one-block long Concord Place which was mostly developed in the years between 1900 and 1914. 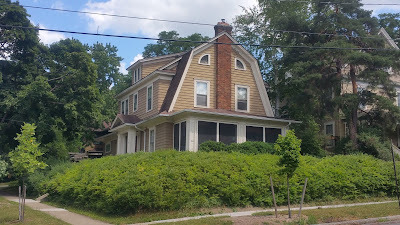 A big house at 116 Concord has a gambrel cross-gable, and there is a similar house at 120 Concord. At the east end of the street even Arts and Crafts architect Ward Wellington Ward adapted the Dutch style in 1910 for the main wing of the Tuck House, at 126 Concord Place, one of his early houses in the neighborhood. 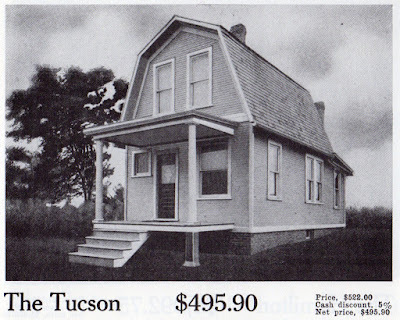 Even in the teens, the gambrel roof was also being employed in more modest designs such as the New Eden and Tucson house models in the Aladdin Built in a Day House catalog of 1917. These houses derive from the simple gable-front "homestead" house that was come on small farms and more rural lots, but also was an easy-to-built starter home for a family of modest means living on a city street. Slightly more robust versions of these homes can be found throughout the Westcott Neighborhood, including 712 Lancaster Ave. and 115 Clarke Street. 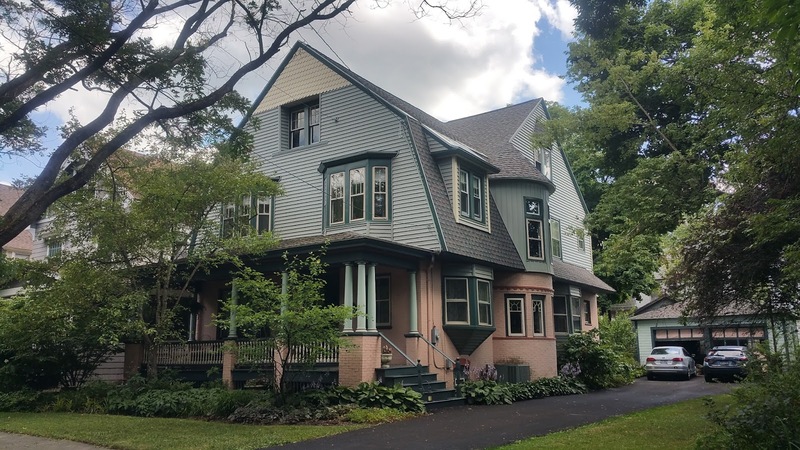 In the 1920s the Dutch Colonial design was a very popular variant of new Colonial Revival architecture, especially in the expanding urban and suburban development area where single family homes were promoted. The two-story version was favored by proponents of well-design small homes, and many examples were featured in widely circulated manuals and books of house designs during the 1920s. In the first three decades of the 20th century the so-called Dutch design was a popular one in various building catalogues. Soon versions of it could be found in mail-order-house company offerings. Aladdin’s attractively designed “The Lancaster,” “a Dutch Colonial type and one of the most truly artistic Aladdin homes,” is depicted in its 1915 catalog. Perhaps reflecting its relative newness as a type, the copy notes that “The Lancaster [is] an original design from the Aladdin architects.” It immediately became a popular type. 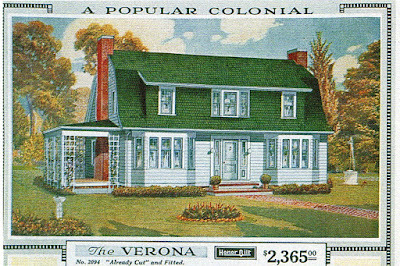 “The Verona,” a gambrel-roofed house of this type available from Sears between 1918 and 1926, was another attractive version, with a surprisingly sumptuous living room twenty-seven feet long, made all the more appealing in the 1918 catalog by the rich color plates used to illustrate it. ...Fourteen [Dutch Colonial Homes] were included in the 1929 compendium Small Homes of Architectural Distinction: A Book of Suggested Plans Designed by The Architects' Small House Service Bureau, Inc., edited by Robert T. Jones, “technical director” of the Bureau. 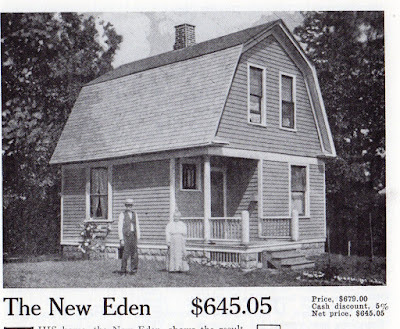 ...Sears offered thirteen or fourteen models of so-called Dutch Colonial houses between 1918 and 1937. In The Books of A Thousand Homes (Vol. 1), compiled by Henry Atterbury Smith and first published in 1923 by the home Owners Service institute, there are many examples of Dutch Colonial designs. Vol 1 is reprinted as a Dover edition with the new title 500 Small Houses of the Twenties (Dover, 1990). Reiff, Daniel D. Houses from Books: Treatises, Pattern Books, and Catalogs in American Architecture, 1738-1950: A History and Guide (University Park, PA, Penn State University Press, 2000. Smeins, Linda, 1999. Building an American Identity: Pattern Book Homes & Communities (Altamira Press, 1999). 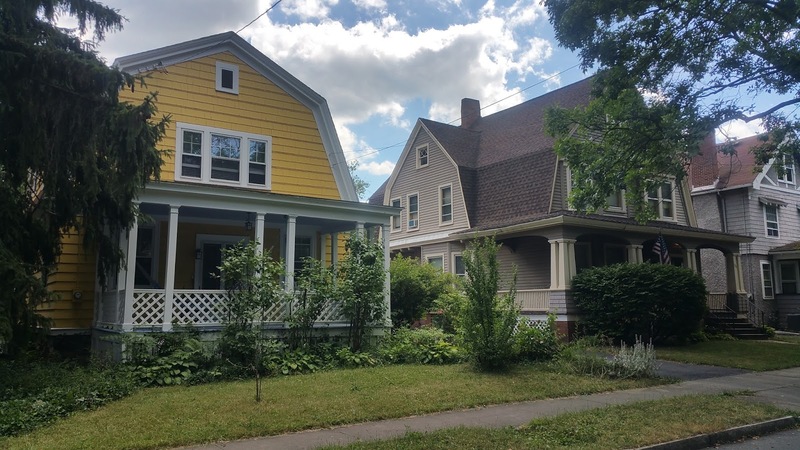 I've recently written about beautiful Queen Anne style houses on North McBride Street and houses built by an early Syracuse Mayor Lyman Stephens. 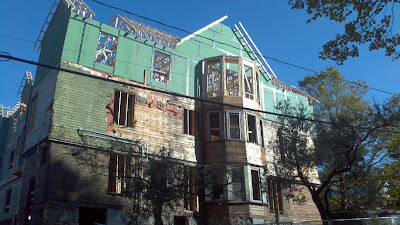 Let's continue these themes - here are more mayors' Queen Anne houses and two of the are on North McBride Street, too. 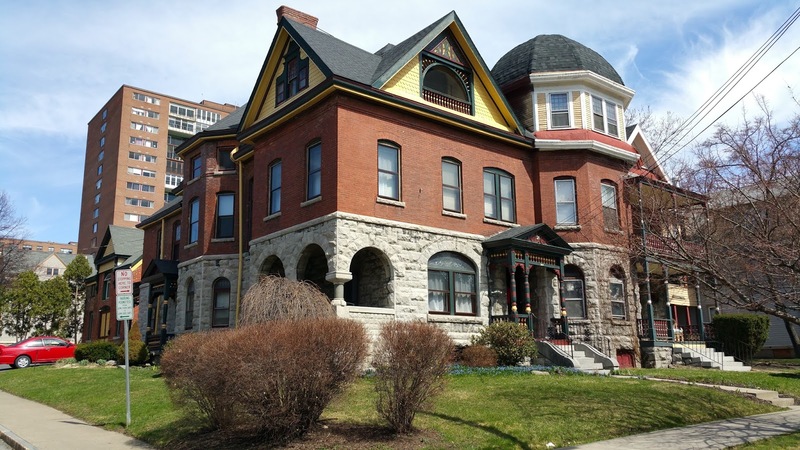 At 201-203 Green Street, on the northeast corner of Howard Street, is a palatial brick and stone Romanesque style residence with delicate porches and a polygonal tower. In 1895, two opposing candidates for mayor occupied the two halves of the building. Republic Charles Baldwin (running on the Citizen's Municipal Reform Party ticket) and and Democrat James Kenndy McGuire (1868-1923) lived side-by-side. 27-year-old McGuire, Syracuse's "boy mayor," won the election and served until 1901. 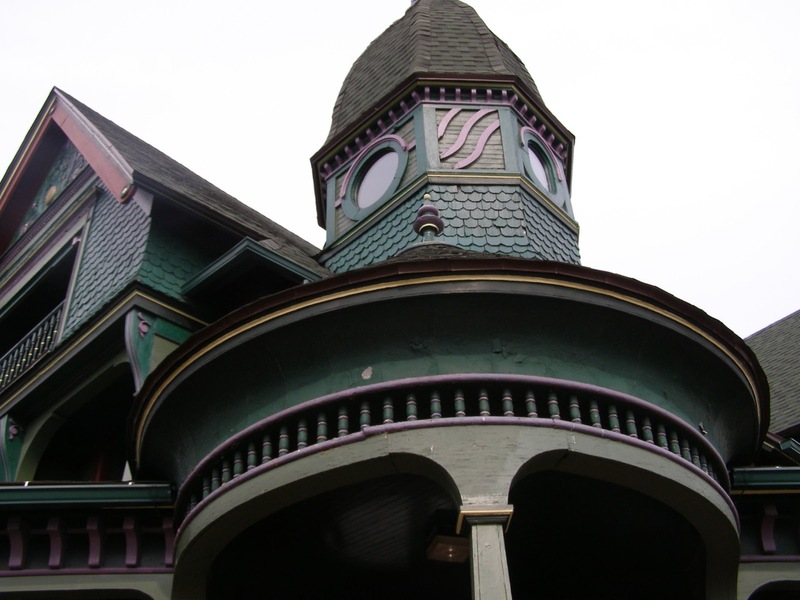 The building was restored in the 1980s by the owner Joan Farrenkopf and preservation architects Crawford & Stearns. 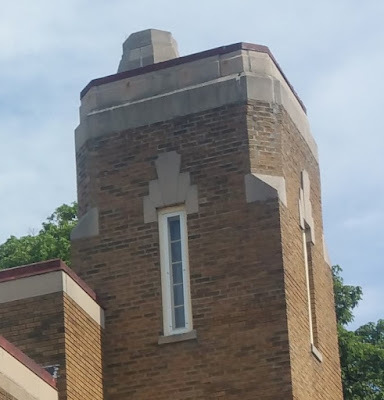 This project, and those on the 300 block of North McBride helped revive the identity of the recently-designated (1979) Hawley-Green National Register Historic District. McGuire was one of the most influential and progressive (despite being a Democrat) mayors of the early city, especially championing the building of new schools. He was an ex-mayor at age 33 and went on to a active and public life, especially associated with cause of Irish nationalism. His life story has recently been researched and published in the biography James K. McGuire: Boy Mayor and Irish Nationalist by Joseph E. Fahey, well summarized by James McKillop. 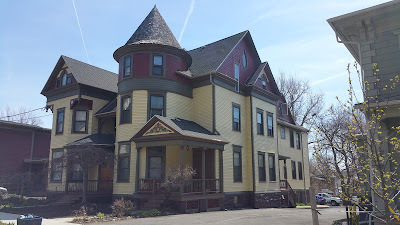 Just up the street, on the north side of the 200 block of Green Street, at 216-218, is massive multi-storied Queen Anne style house with a large cylindrical tower built in 1890 for Congressman Michel E (“Honest Mike”) Driscoll who served seven terms in the United States House of Representatives. 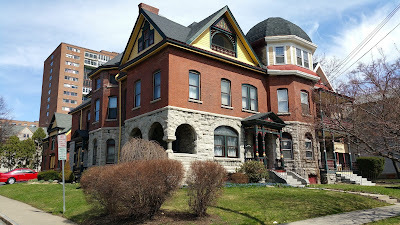 On North McBride Street, on north side of James Street, are two other excellent examples of the Queen Anne style; the Truesdell-Schoeneck house at 500 N. McBride Street, and the Louis Will House at 714 North McBride. 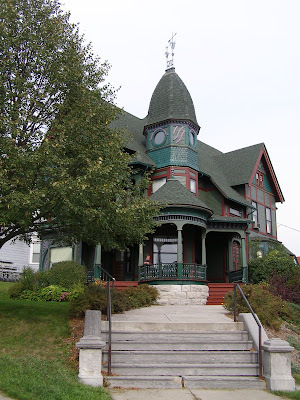 The Truesdell-Schoeneck House was built in 1892, from an elaborate architectural kit provided by catalogue purchased by the original owner John Truesdell. The kit, which would be shipped by train and then built by local carpenters, is attributed to architect George Franklin Barber. 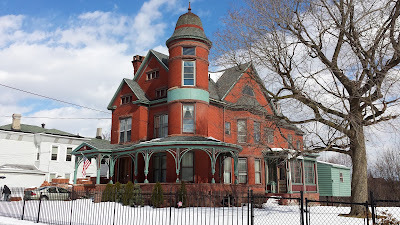 The house was subsequently occupied by Edward Schoeneck who served as mayor of Syracuse and a New York lieutenant governor. 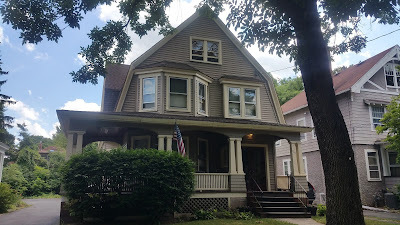 Further North, at 714 North McBride Street is Lovely Louis Will house, built in 1885, and home to candle manufacturer Louis Will. Will was Progressive Party (Bull Moose) mayor of Syracuse from 1914-1916. The architect of the house has not been identified. The brick house is built on a sandstone foundation, with some terracotta decoration. A fine expansive porch, of the type once seen on many houses throughout the city, wraps around the front (west) and south sides. 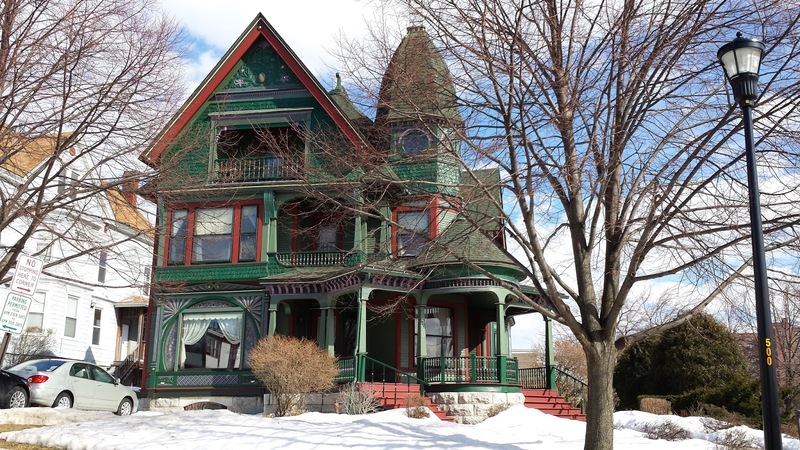 The house has stained glass windows, purported to be early works of the Tiffany studios (n.b. I have not seen these close up). Louis Will was the child of German immigrants. After his father's death he and the family began making and selling candles. The firm Eckermann and Will was founded about 1875 and the successful firm later merged with its competitor to form Will and Baumer Candle Company in 1896. In the subsequent decades Will expanded his business dealing into many other area, and entered public life leading to his one term as mayor. Later, in the 1920s and 1930s he played a major role advocating the removal of railroad lines form the downtown streets leading to the creation of the elevated rail line a few years after his death in 1932. 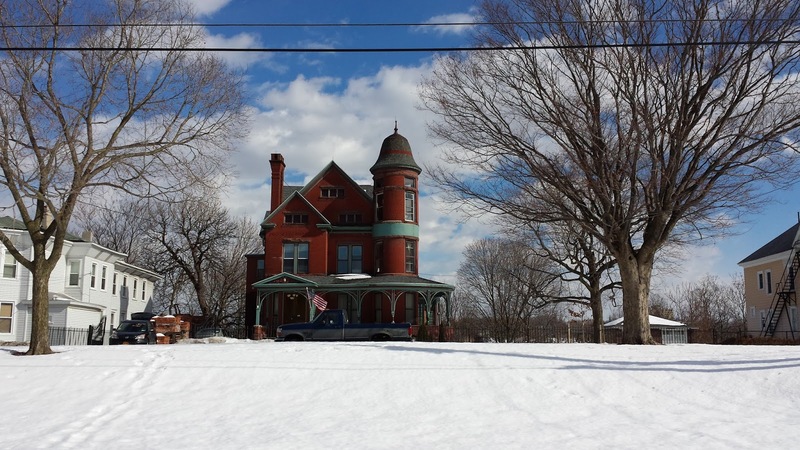 The family sold the North McBride house in 1944 and it became a residence for the Salvation Army. In 2000 it was purchased by a private owners who as worked to restore it to its original beauty. The Truesdell-Schoeneck House is a local protected site. The Will house was listed on the National Register of Historic Places in 2009. Old (fire) engine houses are found all across the city of Syracuse. Most of these are too small to accommodate modern-day firefighting trucks and equipment and so have been sold off over the years to private owners, or have been converted to serve some other public function. These out-dated engine houses date from the late 19th century through the mid-20th century. 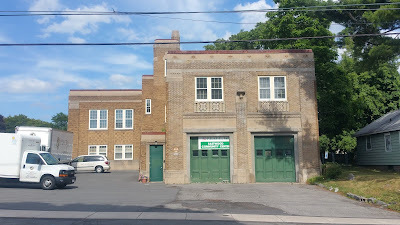 Engine House 17 was built in 1929 on South Midler Avenue and Sunnycrest Rd., after the annexation of Eastwood by the City of Syracuse in 1926. The building replaced a substantial two-story gable front, wood frame structure built in 1907 that served as sort of village hall. 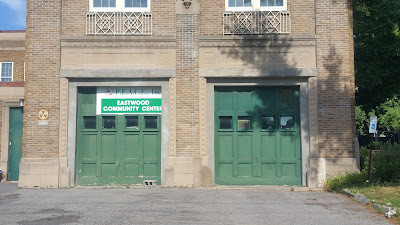 The new building, just a block east of the Eastwood High School (1922), continued this purpose with police and fire services until 1988. I have not yet identified the architect or builder. 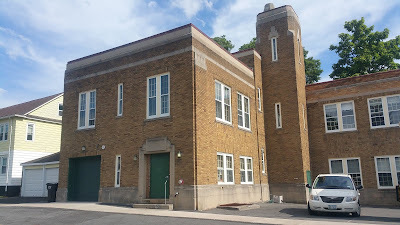 Today it houses the Frank DeFrancisco Eastwood Community Center run by PEACE, Inc. 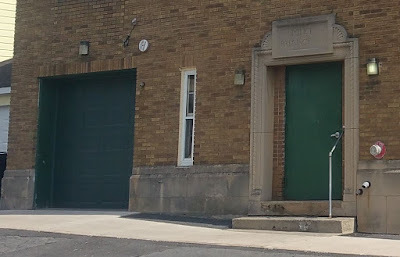 The Syracuse engine houses were built in many styles, including Renaissance, Flemish (Engine house 10), Tudor and Modern, but all have some basic components. The most distinctive of these features visible on the exterior are the ground floor garage bays for the engines and the attached tower which was used for drying hoses - these let anyone know what the building was once used for. 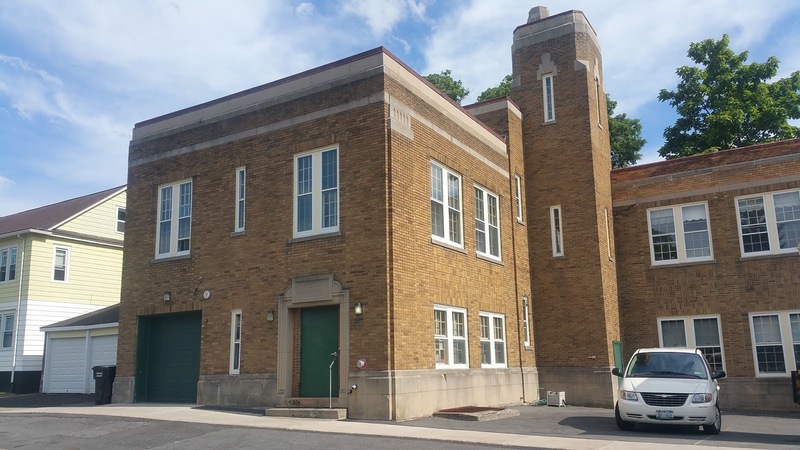 The attractive Engine House 17 with Art Deco detailing around the door frames and at the roof line served as dual public service center, housing both Engine Company 17 and Police Precinct 5, which was entered through a decorated doorway on the side. For more on the history of Eastwood see Margaret McVicker, Did You Know? : A History and Memories of Eastwood, (Syracuse, 2010).